Yes, like a slinky. These marble-looking sculptures that look like they're from Ancient Greece are actually completely malleable, deformable, slinky-like art pieces. 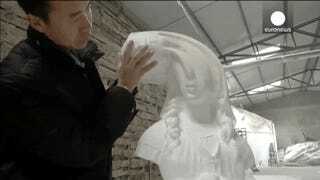 You see, the sculptures are made from thousands of sheets of paper to appear solid when still. When you tug at the sculpture though, you can stretch it out however you like.